Galerie Simon (Daniel-Henry Kahnweiler), Paris. Acquired from the above by the present owner, 1999. Monsieur Quentin Laurens, the holder of the Droit Moral, has kindly confirmed that this work is registered in his archives. 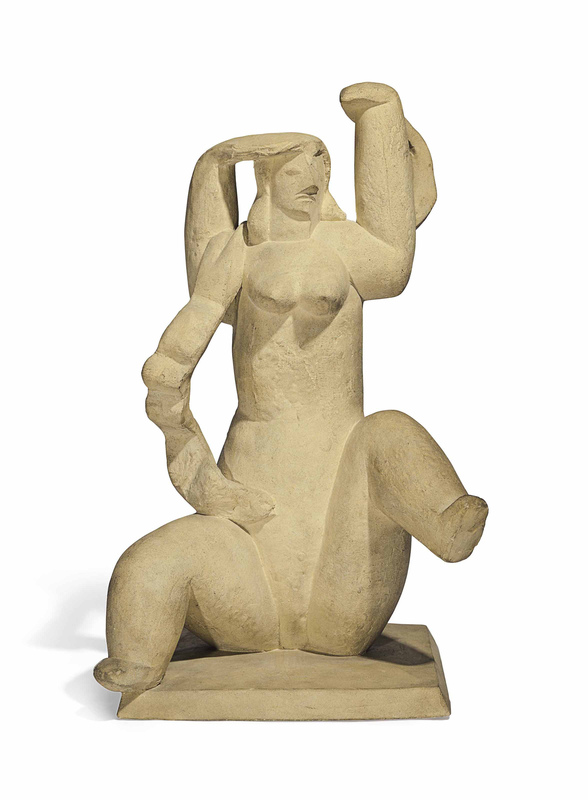 In the mid-1920s, Laurens began to turn away from the planar and angular style of his early cubist sculpture, as he took a more biomorphic and organic approach to form, tinged with the prevailing classicism of that era, which infused his work with softness and sensuality. He became interested in the form of the figure as a whole, instead of regarding it as a sum of parts, and he sought to impart to his figures a more naturally rhythmic dynamism. He imposed upon himself a formal regimen, which required him to "[open] up the volume and [create] a flowing interpenetration of torso and limbs," (quoted in W. Hofmann, The Sculpture of Henri Laurens, New York, 1970, p. 42). His sculpted female figures of marble, terracotta and bronze would remain voluptuous through the end of his career, and in accordance with classical principles, such as with the present Femme aux bras léves, he placed an increasing emphasis on large and fully integrated figures meant to be viewed in the round.